New Justice in Mexico and Wilson Center Report: The U.S. Fentanyl Boom and the Mexican Opium Crisis: Finding Opportunities Amidst Violence? 02/11/19- Fentanyl overdoses in the United States have risen tenfold in just four years and are now related to 60% of total opioid deaths. According to a working paper by Romain LeCour Grandmaison, Nathaniel Morris and Benjamin T. Smith, the dramatic increase of fentanyl use in the United State is generating a parallel and rapid collapse in the price offered for raw opium in rural Mexico. In the working paper titled “The U.S. Fentanyl Boom and the Mexican Opium Crisis: Finding Opportunities Amidst Violence?” the authors utilize the case studies of two villages in Nayarit and Guerrero, Mexico, respectively, to analyze the socio-political effects of U.S. fentanyl use on the opium and heroin economy in Mexico. The findings of this study have important implications for public security in Mexico, as well as major ramifications for international counter-drug efforts. The authors provide historical context to illustrate the trends in the Mexican opium markets. There were various increases and declines in the production of the drug within Mexico before the 1990s. A notable change to opium production came with the introduction of the North American Free Trade Agreement (NAFTA) in 1994, which gradually increased price competition until 2008, thereby negatively affecting Mexican rural communities. As a result, many farmers turned to the cultivation of narcotics. 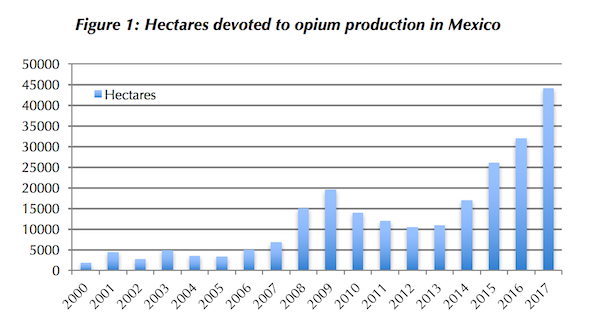 According to United Nations Office on Drugs and Crime (UNODC), the number of hectares of opium poppies in Mexico increased from 1,900 hectares in 2000 to 44,100 hectares in 2017. The authors illustrate the effects of the shift from heroin to fentanyl through two case studies: Village A, located in Nayarit, and Village B, located in Guerrero. Both villages are poorer than the national average with 61.6% of the population of Village A and 33% of the population of Village B living in extreme poverty. Additionally, both villages are located in states that face high levels of violence. The people of Village A have traditionally depended on agriculture for their livelihoods. Beginning the in mid-1980s, the inhabitants began depending on the cultivation of opium poppies and, to a lesser extent, marijuana to supplement their income with very little knowledge of the laws prohibiting these narcotics. However, with the fentanyl crisis, the last year has seen a more than 50% decline in the price of opium in Village A from 18,000 – 20,000 pesos ($950 – $1,050 dollars) per kilo in early 2017 to 8,000 pesos ($420 dollars) per kilo by mid-2018. As a result, some villagers have emigrated while other have become wage-laborers for drug trafficking organizations (DTOs) that they previously had little contact with. According to the authors, 95% of males in Village B are involved in poppy production. While most people are involved in cultivation, a substantial number is also involved in the processing of opium paste into heroin. Local drug bosses sell the pure heroin to bigger organizations that are capable of selling and transporting the drug. Before the fentanyl crisis, a local farmer could make around 80,000 pesos ($4,230 dollars) a year through poppy cultivation. However, between October 2017 and the summer of 2018, prices dropped to 6,000 pesos ($315 dollars) a kilo. As with the case of Village A, locals are concerned that should the decline in prices continue, they would be forced to leave their village. The problems confronting the inhabitants of Village A and B signal larger trends, such as the value of opium to rural communities in Mexico and the radical decrease of value of opium over the past year. The authors offer that the current opium crisis may provide an opportunity to shift from their dependency on illicit crops and away from drug trafficking. The high risk involved in the production of narcotics that was previously outweighed by large returns may no longer be worth it as a result of price declines. In their paper, the authors examine two alternatives widely touted by politicians as solutions to poverty and violence: drug legalization, which could convert the cultivation of opium into morphine production for Mexican hospitals, and crop substitution, or the replacement of the cultivation of illicit crops for food cultivation. The authors find neither of these solutions are “silver bullets.” Additionally, although there has been a reduction in heroin production, this will not likely lead to lasting peace, as DTOs are liable to move to other illicit activities. Despite these concerns, if legalization and crop substitution are properly implemented and combined with broader security policies, they could integrate rural areas into the country for good. The Bahía de Banderas Regional Criminal Justice Center opened on January 15, 2019. Source: Noticias de la Bahía. 01/27/19 (written by kheinle) — The Bahía de Banderas Regional Criminal Justice Center (El Centro Regional de Justicia Penal) officially opened on January 15, 2019. It includes two oral trial courtrooms; areas for conflict and alternative dispute resolution; designated space for protected witnesses; and offices and amenities for judicial system operators, judges, prosecutors, and defense attorneys to work. The two oral courtrooms add to Nayarit’s 12 other such spaces throughout the state. The Center cost $25 million pesos (~$1.3 million USD) to construct. High-ranking state and judicial officials attended the grand opening. Nayarit’s Governor, Antonio Echevarría García, spoke to the role the Regional Center and other state and national institutions play in combatting corruption and impunity. President of the Nayarit Superior Court Ismael González Parra added that the Justice Center consolidates and streamlines the oral penal system in Nayarit. “…We are complying with commitments under Plan Mérida, an international security treaty established by the United States and Mexico to strengthen our institutions that procure and administer justice,” he said. The new center also complies with a state reform passed in September 2018, writes Periódico Express de Nayarit, that integrates representatives from the state’s executive and legislative branches in the Judicial Council (Consejo de la Judicatura). Ultimately, the center supports the advances made nationwide under Mexico’s New Criminal Justice System (Nuevo Sistema de Justicia Penal, NJSP). President of the Nayarit Superior Court Ismael González Parra (middle) and Governor of Nayarit Antonio Echevarría García (right) unveil the new Bahía de Banderas Regional Criminal Justice Center. Source: Periódico Express de Nayarit. 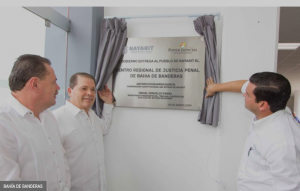 The Bahía de Banderas Regional Criminal Justice Center is one of several Justice Centers now in operation in Nayarit, according to the Mexico’s Consejo de la Judicatura Federal. The state’s first Regional Criminal Justice Center (El Centro de Justicia Penal Federal) was opened in February 2016. Located in Nayarit’s capital, Tepic, it cost almost $59.5 million pesos (~$3.1 million USD) to build. Another center, El Centro de Justicia Penal Federal en el Archipiélago de las Islas Marías, opened in October 2017. There are other centers, too, that focus on other areas of law, like Nayarit’s Justice Center for Women (El Centro de Justicia para la Mujer), which opened the same day as the Bahía de Banderas Regional Criminal Justice Center. These centers replicate others throughout Mexico in terms of function, capacity, and technological advances to procure and administer justice. Justice Centers play a critical role in Nayarit’s and Mexico’s decade-long judicial reform efforts. During the New Criminal Justice System’s eight-year implementation period (2008-2016), Nayarit was considered a post-reform adopter. In a 2015 special report, “Criminal Procedure Reform in Mexico, 2008-2016,” Justice in Mexico found that state level implementation efforts of the NSJP were fairly limited up until 2013. It noted that many states at that time were still behind in the process of meeting the June 2016 deadline to fully comply with the 2008 constitutional reforms. Nayarit’s State Congress then approved and launched oral adversarial trial reform in 2014, and the state has continued to make progress over the years towards executing the NSJP. Opening Justice Centers in 2016, 2017, and 2019 exemplify such efforts. Secretaría de Gobernación. “En Nayarit inicia el Nuevo Sistema de Justicia Penal.” Government of Mexico. March 23, 2014. Rodríguez Ferreira, Octavio and David A. Shirk. “Criminal Procedure Reform in Mexico, 2008-2016.” Justice in Mexico. October 8, 2015. Vargas, Gustavo. “Se instala Centro Regional de Justicia Penal en Tepic.” Nayarit en Linea. February 25, 2016. “Inaugura CJF centro de justiciar integral en el archipiélago de las Islas Marías.” El Sol de Nayarit. October 20, 2017. Casillas Barajas, Julio. “Inaugurán centro regional de justicia penal.” Periódico Express de Nayarit. January 14, 2019. “Antonio Echeverría inaugura el Centro de Justicia para la Mujer y el Centro Regional de Justicia Penal de Bahía de Banderas.” Noticias de la Bahía. January 15, 2019. 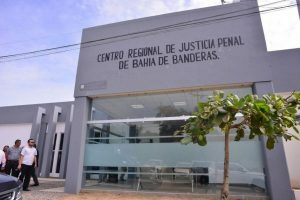 “Inauguran Gobernador y autoridads judiciales el Centro Regional de Justicia Penal de Bahía de Banderas.” Periódico Express de Nayarit. January 16, 2019. Website. “Reportes: Directorio.” Consejo de la Judicatura Federal. Last accessed January 26, 2019. Informe ejecutivo sobre avances en la implementación del Nuevo Sistema de Justicia Penal. México: Consejo de la Judicatura Federal, August 2015. 02/23/17 (written by Daphne Blanchard) – The alleged leader of the Betrán Leyva Organization (BLO) in Nayarit, Juan Francisco Patrón Sánchez, “El H2,” was killed in a clash with Mexican military forces on February 9 in Nayarit. 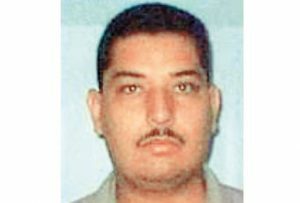 The day after, the alleged second in command of the BLO in Nayarit, Francisco Daniel or Daniel Isaac Silva Gárate, “El H9” or “El Señor de las Tanquetas,” was also killed in a subsequent battle. Between the two days, 15 suspected Beltrán Leyva cartel members were killed, including the two leaders. Nayarit Governor Roberto Sandoval Castañeda confirmed the incident at a press conference. He was accompanied by the head of the Mexican Army (Ejército Mexicano), Navy (Secretaría de Marina, SEMAR), Center for Research and National Security (Centro de Investigación y Seguridad Nacional, CISEN), federal Attorney General’s Office (Procuraduría General de la República, PGR), and Nayarit State Attorney General’s Office (Procuraduría General de Justicia del Estado, PGJE). Juan Francisco Patrón Sánchez, H2. Photo: Milenio. The following day, another alleged Beltrán Levya leader, Silva Gárate, was confronted in the community of El Ahuacate, also in Tepic, Nayarit. According to an anonymous source in the Mexican Navy who confirmed Silva’s shooting, members of the military intercepted the leader’s vehicle, as he fled the coordinated operation involving the Navy and Nayarit State and Tepic Municipal police. Gunfire ensued, resulting in Silva’s death and that of three of his cartel companions. The loss of Patrón and Silva deals a significant blow to the Beltrán Leyva organization. The BLO is reportedly active in the northern state of Sinaloa and the southern state of Guerrero. Patrón had been allegedly leading the cartel since 2014 following the arrest of Héctor Beltrán Leyva and the death of Arturo Beltrán Leyva, previous BLO leaders. As chronicled by El Universal, Patrón then assumed control of the cartel alongside Fausto Isidro Meza Flores, “El Chapo Isidro,” though the latter was arrested the year later and subsequently extradited to the United States. For his part, Silva was the presumed lieutenant of the Beltrán Leyva territory in Nayarit under Patrón’s command. “Confirma Semar 12 miembros del cártel de los Beltrán Leyva abatidos en Nayarit; el “El H2”, entre ellos.” Proceso. February 10, 2017. Méndez, Karla. “Abaten en Tepic a ‘El H2’, líder del Cártel de los Beltrán Leyva.” Excélsior. February 10, 2017. Méndez, Karla. “Tras hechos violentos; instalan retenes en Tepic, Nayarit.” Excélsior. February 10, 2017. “Mexican marines use helicopter gunship to kill alleged cartel leader and members.” The Guardian. February 10, 2017. Navarro, Myriam. “Asciende a 15 cifra de muertos por balacera en Nayarit.” La Jornada. February 10, 2017. Méndez, Karla. “Ponen retenes en Tepic; confirman 15 muertos.” Excélsior. February 11, 2017. Garduño, Javier. “Dectectan células de los Beltrán en siete entidades.” El Universal. February 12, 2017.